To find a good ‘eye of the duck’ scene as described by David Lynch, I suppose you’d instinctively head to the left-field; to films that are the work of auteurs who wants to convey a particular vision. But for me, one of the great scenes that falls into the category is slap bang in the middle of one of the all time great blockbusters. The pop corn movie that changed cinema for ever. The film is Jaws and the scene is that moment of calm when the three lead characters, Brody, Hooper and Quint, bond below deck of The Orca. The title of the scene could be ‘Who’s Scar is Bigger’, ‘The Indianapolis’ or ‘Show Me The Way To Go Home’; any of those would do because in ten and a half minutes the scene changes gear and mood three times, covering all of those things before it’s abrupt ending. We join the three men in the middle of the night (or maybe the early morning) after their first day hunting the shark. They’ve had some success and some failure. The inevitable personality clashes happened, mainly between Hooper and Quint while Chief Brody has been left shaken by his first face-to-face meeting with a great white. The shark is currently dragging round a couple of barrels designed to slow it down and bring on a level of exhaustion that will give the crew an opportunity to kill the beast. The men are washing down a meal with a few drinks. Brody has taken a bump on the head and Quint spots him checking it; he tells him it’s nothing and this kick starts an escalation of one-upmanship stories as Hooper and Quint compare scars and their origins. The shot is constructed masterfully with Spielberg positioning the two men at opposite sides of the table, keeping them as far apart as possible but as the scars grow in size they move closer together. The physical space being a visual metaphor for the psychological space between them; they’re adversaries that are discovering they have they have common bonds despite their vastly different backgrounds. They drink and laugh together, making a connection that until then had been resisted. Brody is still clearly the outsider here and he does not join them around the table. The final scar changes the atmosphere and ushers in one of the great monologues in film. It’s a mark on his arm where Quint had removed an old tattoo that said he was on the USS Indianapolis. His mood instantly sinks and the colour seems to leave the face of Hooper who is aware of the history of that vessel. Quint recounts his experiences of being on board the ship that delivered the atomic bomb that ended World War Two and being sunk on the return journey. How they were stranded in the ocean and surrounded by sharks that attacked and decimated the surviving crew. It’s now becoming clear why Quint hunts sharks and why he has so many barriers between himself and other people. Quint finishes his story to the silence and shock of the other two men, and as if it has been listening in, a whale now sings it’s song from somewhere in the darkness outside. Quint begins a mournful rendition of ‘Spanish Ladies’, maybe in reply to whale or just to think about something else; but he’s still mentally back with the crew of the Indianapolis and trails off without finishing the song. Hooper, in support, starts to sing. He chooses ‘Show Me The Way To Go Home’, a song he knows all three men will know and as they all sing Brody finally joins them at the table a smile returns to Quint’s face. The song is a three-way hug for the men, a way of giving support without physical contact. For the second time in the scene a song remains unfinished as the final act of the film comes crashing in. As always with the eye of the duck scene, if you removed it the film would still get to it’s conclusion with no plot issues. Spielberg could have had the shot of the shark swimming away from the boat with barrels attached and then cut to morning, to the return of the shark and all three men would still get to the end of their own story. But we would lose so much. In just ten minutes we have been shown different sides of the characters and been given motivations that were not previously visible. As an audience we have been drawn in, Hooper and certainly Quint have given us more reasons care about them. 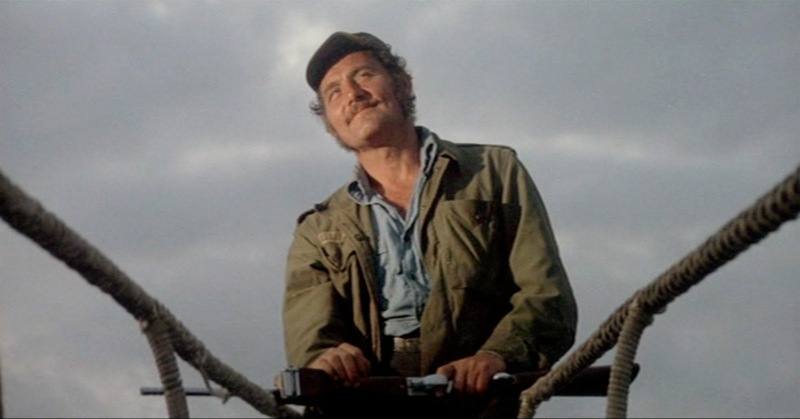 When Quint meets his fate he is not just a grizzled old sailor who has hunted one shark too many, he has become a complex character whose end has a sense of destiny to it. More often than not the eye of the duck is for the audience, it adds texture to the world, but what is so strong about this scene is that the characters have gone on a similar journey of discovery. The three men have become closer; have a better understanding of each other and instead of just being there for their own ends, they are now in this together. I’ve been unable to find the scene in its entirety in one video, but here is the whole thing as three parts.